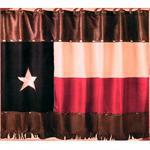 Western Bath Decor Western Decor for the Bathroom Western Shower Curtains and Hooks. 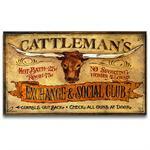 Barbwire Shower Curtain, Cattle Brands, Western Riders, Cattle Brands, Cowhide Print Western Shower Curtain and more. 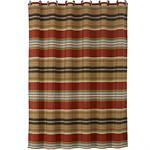 Alamosa Southwestern Western Shower Curtain. Combination faux ostrich leather, conchos and geometric print on ivory. 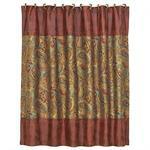 Includes fabric covered shower curtain rings. Measures 72x72. 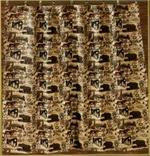 Clearance Wildlife Bears fabric shower curtain. Measures 72x72. Limited stock. 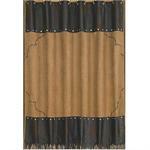 Caldwell Ranch Faux Tooled Leather and Faux Cowhide Shower Curtain. 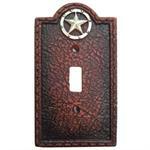 Rustic Western styled chocolate faux tooled leather top and bottom accented with faux cowhide printed micro-velvet. 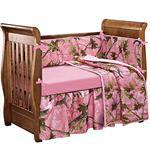 Includes fabric covered shower curtain hooks. Measures: 72x72. 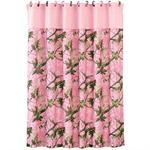 Oak Camo Shower Curtain. 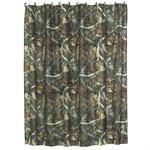 Includes 12 camo fabric covered shower curtain rings. 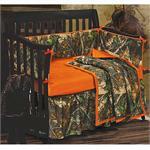 This shower curtain goes great with our other Oak Camo Comforter Set and accessories. Measures 72x72. 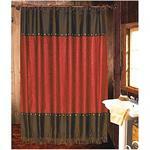 Cheyenne Faux Tooled Leather and Fringe Shower Curtain Red. Decorated with grommetts. 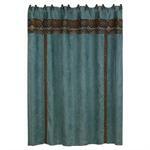 72" x 72"
Cheyenne turquoise faux tooled leather rustic western floral embossed design combined with distressed border and fringe Shower Curtain. Decorated with chrome snap grommets. Fabric covered shower curtain hooks included. 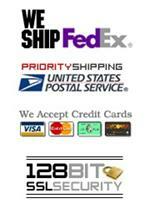 Measure: 72" x 72". Faux suede sets the stage for elegant detailed embroidery. 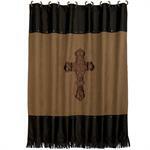 Warm copper tones saturate the detailed cross, while rich faux leather and stylish silver studs border the top and bottom of the curtain. 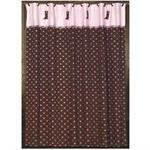 Includes fabric covered shower curtain hooks. 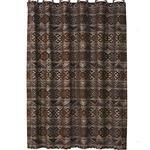 Crestwood Hounds Tooth Rustic Shower Curtain. Measures 72 x 72. 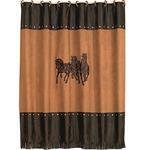 This shower curtain consists of a beautiful dark brown faux leather with an embroidered 3-horse design, and it also comes with twelve coordinating shower rings. 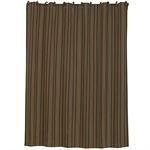 Measures 72"X72"
The Laredo shower curtain is constructed on tan faux suede and attached chocolate faux leather valance. 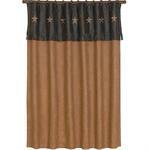 Valance features embroidered tan stars and faux leather fringe. 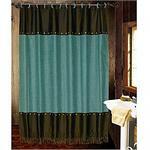 Includes 12 fabric covered shower curtain rings. 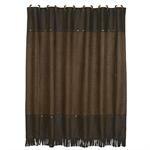 The Laredo shower curtain is constructed on tan faux suede and attached chocolate faux leather valance. 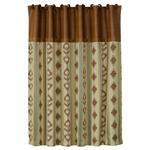 Valance features embroidered turquoise stars and faux leather fringe. 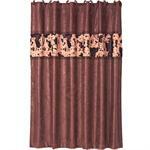 Includes 12 fabric covered shower curtain rings. 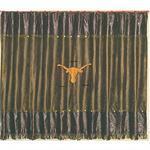 Patched Longhorn Shower Curtain Style BA9069. 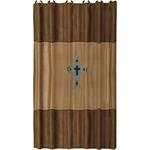 Measures 72" x 72"
Rio Grande Western Decor Shower Curtain Southwestern. Measures 72x72. 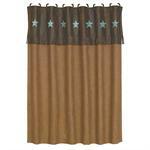 Rodeo Cutting Shower Curtain has faux leather at the top and bottom of the curtain. Additional features include conchos and fringe. 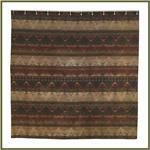 Measures 72"X72"
San Angelo Western Paisley Style Shower Curtain. Measures 72 x 72. 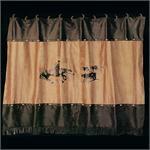 Western Decor Shower Curtain. 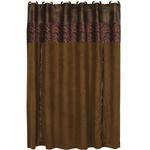 Chocolate faux tooled leather Shower Curtain with chocolate faux distressed leather top and bottom accented with metal studs. Measures: 72x72. 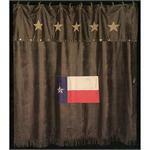 Patched Texas Flag with patched Stars is made of faux suede with fringe long the bottom. 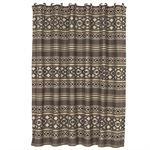 Measures 72"X72"
The Tucson Rustic Southwestern inspried shower curtain created with high quality woven fabric featuring the geometric designs of the great American Southwest. 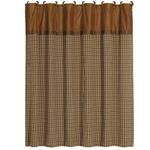 Includes fabric covered shower curtain rings.